On April 24, 1970, China launched its first satellite, Dongfanghong I, and joined the select group of nations boasting an operational space program. On April 24, 2016, the country celebrated its first National Space Day. Last year also marked the 60th anniversary of the creation of China's aerospace industry with the inauguration of the Fifth Academy of the Ministry of National Defence on October 8, 1956. The Academy was tasked with developing rocket propulsion and missiles for military purposes. National Space Day is here to stay. Last year, President Xi encouraged the nation's brightest minds to "seize the strategic opportunity and keep innovating to make a greater contribution to the country's overall growth and the welfare of humankind." China is a relative newcomer in the arena of scientific space exploration. It only launched its first scientific satellite, the Dark Matter Particle Explorer (DAMPE), on December 17, 2015, in collaboration with European partners. China's early scientific efforts have relied heavily on partnerships with the European Space Agency (ESA) ever since their first joint mission, Double Star (2003-2004), which aimed to better understand the Earth's magnetosphere. Developments in Chinese space science are accelerating on multiple fronts. China's space science program has long focused on the near-Earth environment and on reaching the Moon and - hopefully soon - the planet Mars. Recently, the Chinese Academy of Sciences and ESA called for international teams to propose new, medium-sized space missions. One of the teams I joined at the time proposed a mission that would explore the Universe at ultraviolet wavelengths, a regime one can only access from space but which is poorly served by existing spacecraft. However, the joint mission that was eventually selected followed the long-established tradition of near-Earth instead of deep-space exploration: SMILE, the Solar-wind Magnetosphere-Ionosphere Link Explorer, will explore the effects of "space weather" on our daily operations. The impact of space weather is of increasing concern in our high-tech society. It encompasses the conditions in space between the Sun and the Earth that can influence the performance and reliability of space-borne and ground-based technological systems, and which could potentially endanger human life or health. Understanding and forecasting space weather is deemed so important, that the main goals of four of the five Chinese scientific space missions that have been approved for launch by 2022 are linked to exploring the impact of the space environment on our daily life. Even the relatively few scientific results obtained with the Lunar Ultraviolet Telescope on the Yutu (Jade Rabbit) rover, which was taken to the Moon by the Chang'e 3 spacecraft in December 2013, are related to the interplay between the highly charged particles emitted by the Sun, known as the "solar wind," and the Earth's magnetic field. Only three of the 10 recent and approved future Chinese scientific space missions address blue-skies research, science that does not necessarily lead to immediate practical applications. In addition to DAMPE, the Hard X-ray Modulation Telescope and the Einstein Probe will explore the Universe in X-rays- highly energetic radiation from objects like black holes that is blocked by the Earth's atmosphere. This mostly practical space science focus is a direct result of the structure of the Chinese space program, which is overseen by the State Administration for Science, Technology and Industry for National Defence, an agency tasked with developing policies for the country's defense industry. Science for the sake of science is clearly not a priority. The Chinese scientific space program is slated to accelerate until at least the early 2020s. Meanwhile, China's space industry has been developing ever more powerful launch vehicles; the maiden launch of a Long March 5 rocket took place on November 3, 2016. With this new capability, China will now be able to place up to 25 tons in low-Earth orbit and up to 14 tons in geosynchronous orbits, at altitudes of some 36,000 km, where most communications satellites are found. 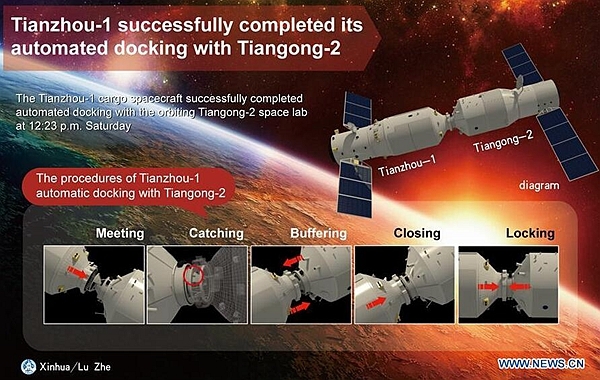 This capacity to take heavier payloads to low-Earth orbit, 200-2,000 km above the Earth's surface, will support the development of the Tiangong 3 space station. The Chinese space station will also operate a 2 m-diameter space telescope, Xuntian, which will be able to observe an area of the sky that is 300 times larger than the field covered by the Hubble Space Telescope, although I have yet to see a compelling scientific justification for the telescope's development. Technology rather than scientific needs drive developments of space hardware. Nevertheless, if even a fraction of China's ambitious space program comes to fruition within the next decade, its scientists will be poised to take a leading role. National Space Day is meant to inspire the country's youth to take up the challenges and devote their careers to boosting the nation's scientific and engineering prowess. Ambitious and lofty goals, but well worth pursuing. Although a relative newcomer in space science, technology and launch-vehicle developments are slated to soon propel China to the field's forefront.